I found a neoclassical exercise I did about my freshman year of high school and kind of polished it into an atonal exercise that mostly focuses on sweep picking, position changes, strange finger movements, and alternate picking across multiple strings. It takes elements of yngwie, paganini, petrucci, and steve morse’s playing into a heavily dissonant straight 16th exercise. It’s got a little bit of 7 string work but not much as, over use of the 7th string especially in solos can destroy any work. This exercise is designed to get you used to switching techniques instantly, instead of having a sweep section and an alternate picking run in your solo, you might throw in both at the same time, a la santiago dobles. Things to notice on this exercise are not in the musicality but in where the articulation is. Almost every note is a specific pickstroke. READ THE MUSIC BEFORE YOU TRY TO PLAY IT! 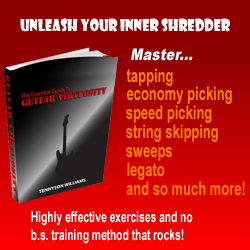 The position shifts are not marked so that this exercise can be used in different ways to help you with different aspects of guitar. The shifts should be pretty obvious and fingerings are rarely marked as, I find there’s only one way to play this exercise at top speed(172 for me, aiming for 212). Articulations are important as they will force you to use different techniques. When you don’t see slurs, don’t hammer/pull off(specifically measures 13/14, the repeated paganini lick). Along those lines, note the tabs in measure 17, the first run peaks on frets 13-17-13 on the e string while the next run is 15-17 then 18 on the b string, not 13 on the E string. This helps facilitate the alternate picking/sweep picking combination by emphasizing the same note on different strings resulting in 2 completely different techniques to complete the run. use it with only one technique(all sweeping, strict alternate, economy) to develop specific abilities. theory and analysis, great exercise for it with all the chromaticism and shifting of roots. Enough rambling. comment below with questions. I hope you guys like it/it helps! Agreed! Those guys are masters, but I’ve seen a number of amateurs using lame tricks on the 7th string to make it seem like they’re much better than they are in reality. Anyway, thanks for the exercises!